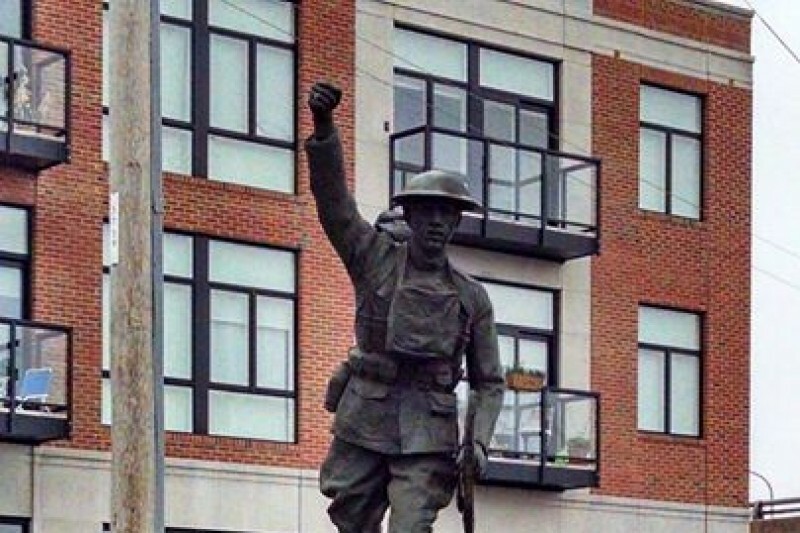 Northern Liberties Neighbors Association (NLNA) is raising money to restore and renovate the Doughboy statue and maintain the park located at 2nd & Spring Garden Streets. We are working with Kreilick Conservation LLC and the City of Philadelphia on the restoration of the statue. The Doughboy statue is located at Second and Spring Garden streets and honors soldiers (known as doughboys) from the community who served from the River Wards. worked with the Office of Housing and Community Development to bring the statue back to its rightful home in our community. The statue is a bronze figure of a WWI Doughboy in uniform with field pack, carrying a rifle with bayonet in his left hand. The sculpture was cast by Flour City Ornamental Iron Works of Minneapolis, MN. A plaque on the front of the granite pedestal reads: “IN MEMORY OF OUR BOYS OF THE SIXTH, ELEVENTH, AND TWELFTH WARDS WHO SERVED IN THE GREAT WAR OF THE NATIONS, 1914 – 1918.” Additional plaques on the right and rear of the pedestal lists the names of soldiers from the area who served in WWI. With your support we will restore the statue to its rightful place and honor those before us. As we celebrate Memorial weekend, we thank all who have served our country. come on vets! gotta be enough in the hood to put this "over the top"!